Macy Gray’s journey as a teacher began at Mayatan Bilingual School, a non-profit in Honduras where she taught sixth-graders. When she returned to Illinois this summer to begin a new job this fall teaching sixth- and seventh-graders at Chicago’s Altus Academy, the 2015 Elementary Education alumna from the Department of Curriculum and Instruction wanted to pursue some professional development. July’s STEM Read Summer Institute empowered teachers to put on their own STEM Read field trips, the brainchild of King-Cargile. These field trips annually attract hundreds of middle and high school students to the NIU campus for professionally delivered gamification days focused around a piece of upper elementary of young adult literature. The institute provided teachers with the tools and materials to run these gamification days for their own classrooms, schools or districts. Honest Abe needed help to find his lost speech. Registrants for the institute received digital toolkits from 2017-18 events; one archived toolkit from the vault; access to one NIU STEM Read Educator webinar per semester for the 2018-19 school year; and the ability to set up virtual coaching sessions with the team during the 2018-19 school year. 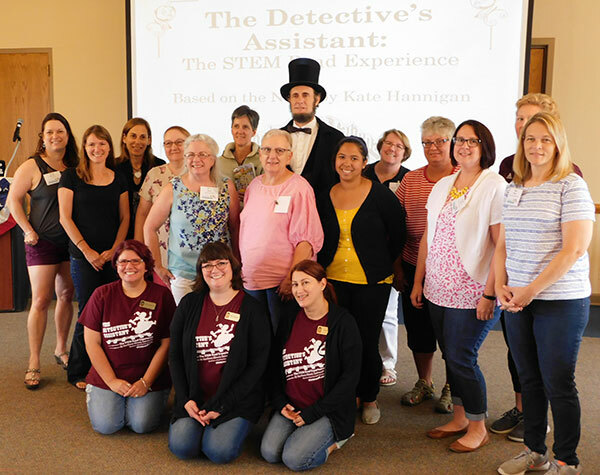 They also now have a one-year access to STEM Read event kits, housed in the Children’s Literature Teaching Collection, as well as business cards from an Abraham Lincoln impersonator who helped the educators conquer a Lincoln-related exercise in detective work. “I thought it was great. 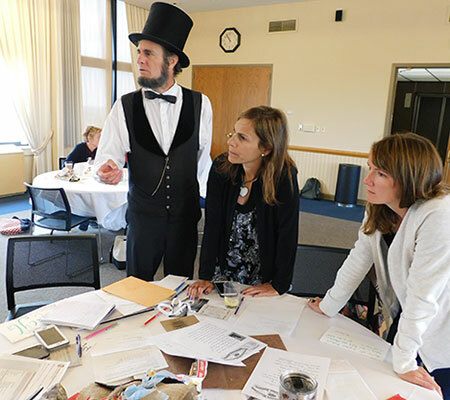 All of the teachers were excited and glad to have experienced this first-hand and to go forward,” says Melanie Koss, an associate professor in the Department of Curriculum and Instruction and director of the Children’s Literature Teaching Collection. 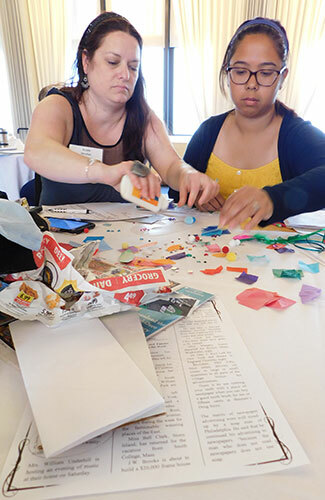 Melanie Koss (back) observes STEM Read Institute educators designing secret clues to covertly alert their unknown comrades. 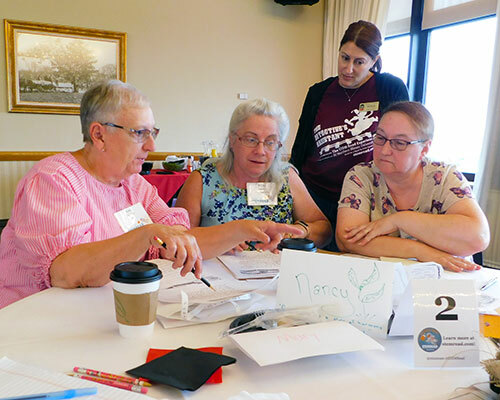 Participants engaged in a session on “Gamifying Artemis,” playing the STEM Read game based on Weir’s latest book, demonstrating to Johnson the power of bringing books to life. Adding STEM Read concepts to her classroom now will allow her to “see how engaged students can be,” she says, citing an idea from Koss to assign students to develop their own games based on books. Sheila Ruh, a media specialist at Westmont Junior High School, came to the NIU institute with colleague Laura Riley. “STEM activities are great for students because they incorporate real-world application of the curricular skills and concepts we teach students. These activities are engaging, incorporate critical-thinking skills and require collaboration with other students,” Ruh says.